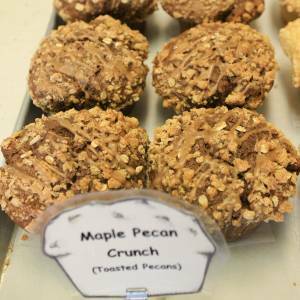 l’Unifolie, or “the one-leafed” pecan crunch is a homage to the national flag of Canada. In-fact, anytime Frank has these muffins in the store the ground is considered Canadian territory and an official embassy of the Quebec government. This maple-leaf muffin is an international delight. Favored by native Anacortesians and expatriate Canadians alike. Take a bite of diplomacy!